To make up for the cost of maintaining, operating, and flying aircraft from location to location, airlines will use an abundance of tricks to get the most revenue possible out of each flight. This can mean, at times, that you may be paying more for effectively the same flight. In this article, we take a look at how you can find cheap flights online and save money on what may be the most expensive part of your travel costs. Note: Even though price comparison websites are awesome, it’s worth noting that not all airlines are included in these sites. For example, Southwest doesn’t show up on Expedia, Orbitz, or any website we mention below, but sometimes they have the best price on a domestic flight in the US. Many people still go directly to their favorite airline or booking website. You can potentially save a few hundred dollars simply by shopping elsewhere. Thankfully, there are many tools available online that save you the hassle of comparing prices yourself. Flight comparison websites will scour the web within seconds, finding the absolute best prices for you on your selected flights. They will suggest a number of different airlines across a variety of different booking websites. One of the most popular price comparison websites is Skyscanner. This powerful website lets you find the best price for your flights by specific date or different prices on each date in a specific month. 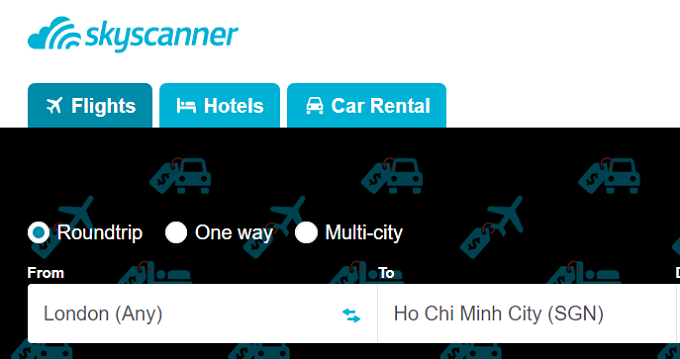 You can visit Skyscanner, enter your departure location, your arrival location, and then the dates. Our best advice would be to input the month you’d like to travel. Here is an example. As you can see from the image above, the calendar provided gives some very useful information on the best prices for each date. 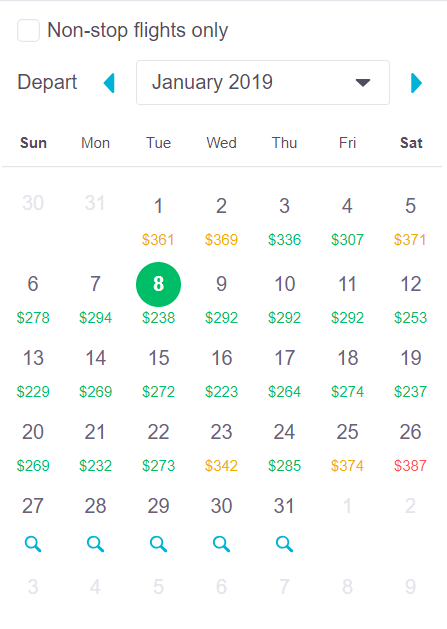 By planning ahead, we can get a flight for cheaper by picking the most optimal dates. 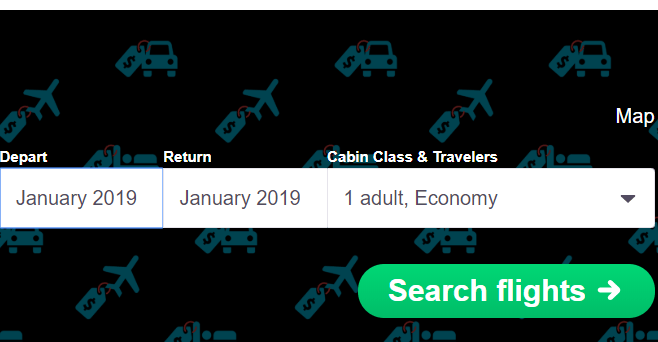 Once a departure and return date has been selected, you can click Show Flights for an overview of what booking websites and airlines can offer on these dates. Skyscanner will give you control over picking the fastest flights, the cheapest, or something in between. There are, of course, many other price comparison options for finding flights. While Skyscanner is very popular, many people have started to move to Google Flights. Just like Skyscanner, Google Flights has a very powerful search tool that can scour the internet for the best prices. You can quickly browse through the days and months to find the best dates possible. While we think you’ll get by fine with just Google Flights and Skyscanner, a couple of other popular options include Momondo, farecompare, and CheapOair. 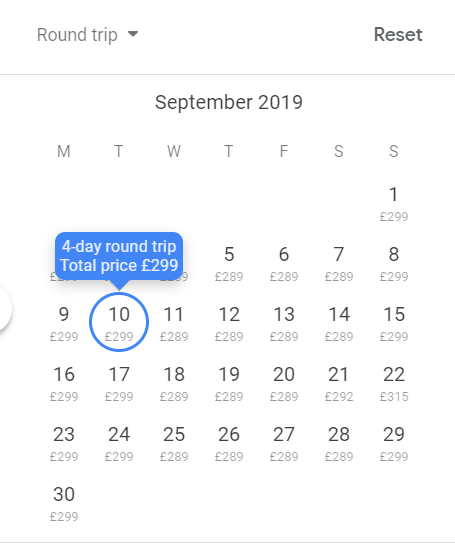 Using a price comparison tool like those mentioned above can be a great way to find the cheapest flight possible for your selected dates, but you can save even more by being flexible with when you depart and return. For example, switching the dates of your flight by just two days could save you multiple hundreds of dollars for long distance flights. 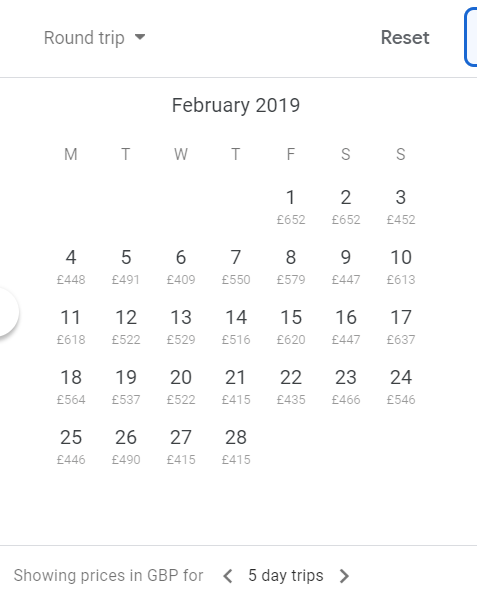 Both Skyscanner and Google Flights can show you how the price can differ across different days. While Skyscanner and Google Flights can help you to find the best possible flight prices, there are still tactics you can use to limit your overall cost further. One of the biggest tips we can offer is to plan ahead as far as possible. It’s very common that prices will increase as you near closer to the date of departure. This is because airlines will start with a base price, but as the supply for tickets on a certain flight lowers, the price will increase. The best thing you can do is book as far ahead as possible, especially for long distance flights that may not happen as frequently as shorter flights. The average ‘best’ time to book is 47 days before a flight, but you can score a good flight price as much as 117 days before your departure. Another great thing about planning ahead is that you can actually sign up to price alerts on both Skyscanner and Google Flights. If a great price comes in that’s within your selected date range, you’ll be notified via email. It can save you money in the short term if you just go for the cheapest airline possible, but if you will be flying to and from a location frequently, try to stick to the same airline. Many airlines will have loyalty systems that reward you for flying with them. You can still use Skyscanner and Google Flights to find the best price for that particular airline, but you can get the added benefits of free or discounted flight costs. 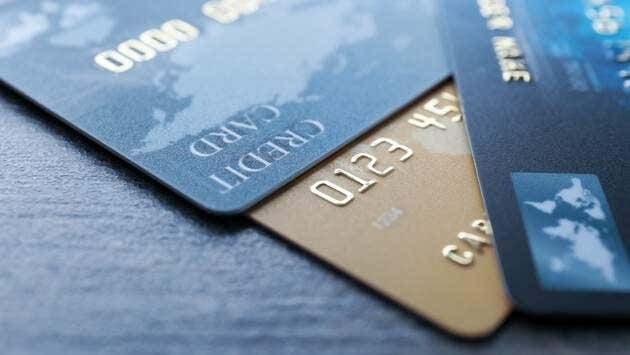 Another great way to save on flights is to use a credit card that offers travel rewards. You should use your credit card for everyday purchases to build up points and over time you’ll have enough to get free flights. Many people believe that using cookies and going incognito can save you money on your flights. While this may be true if you go directly to an airline’s website, you won’t have this problem if you use Skyscanner and Google Flights. Each time Google Flights or Skyscanner performs a search, your cookies or past browsing data won’t have any impact on the results. The prices will adjust sporadically on both platforms, but this will be due to complicated systems airlines use to get the best possible revenue. These systems take into consideration things like current interest in their flights, booked seats, and the time between the current date and the date of departure. In summary, deleting cookies or browsing in incognito isn’t necessary if you use the comparison sites mentioned earlier. When you finally find your flight, be very attentive when booking it. Airlines will try to coerce you into purchasing as many extras as possible. It may be worth paying a little extra to choose your seat, but adding things like meals on short distance flights or special bundles will increase your price quite significantly. Avoid extras unless you actually need them. Some airlines will also use tactics to trick you into spending more. An example could be that an airline will suggest bundles that include baggage before sending you to a separate baggage page. Without reading carefully, you may end up spending more for a package when you could save money by picking out the specific features you need on your flight. Here is an example from Jetstar. 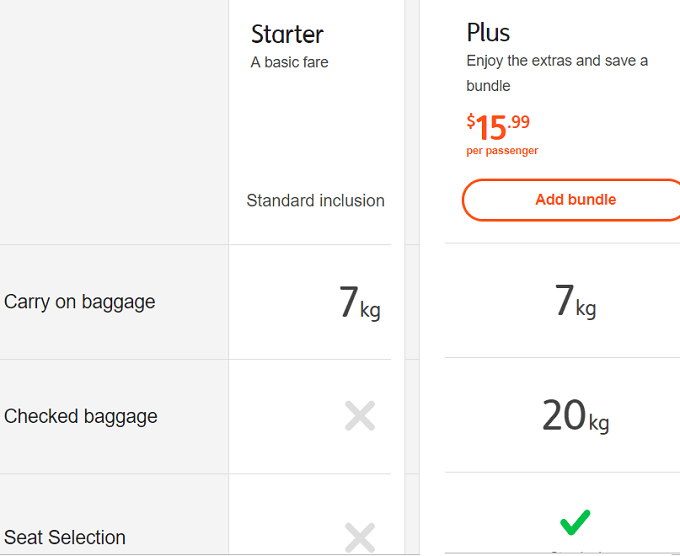 In the image below, you are shown the bundles page before being taken to the baggage page. With a quick glimpse, you may assume that you must pay $15.99 for 20KG checked baggage. 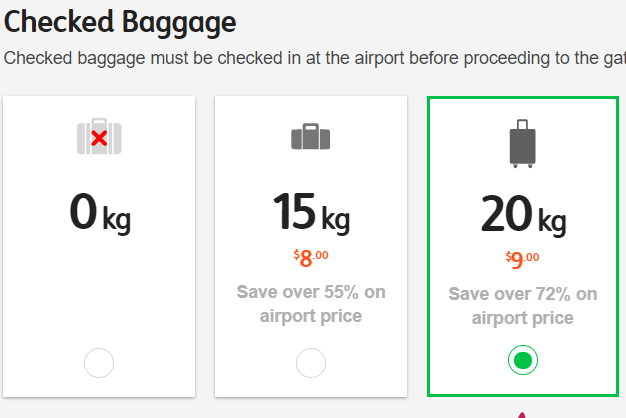 However, if you simply click the starter bundle, you’ll see on the next page that 20KG checked baggage can be purchased exclusively for $9, and you can save even more if you have baggage that weighs less. For an ending note on this, make sure you carefully look over what you are buying before purchasing your ticket. Make sure you do buy what you need online, though, because adding extras like meals or checked baggage at the airport may cost even more if you don’t buy it initially. To summarize this article, here are the tips we’d suggest to help you find cheap flights online. Thanks for taking the time to read our article. Hopefully, the information provided here proved to be useful. Enjoy!